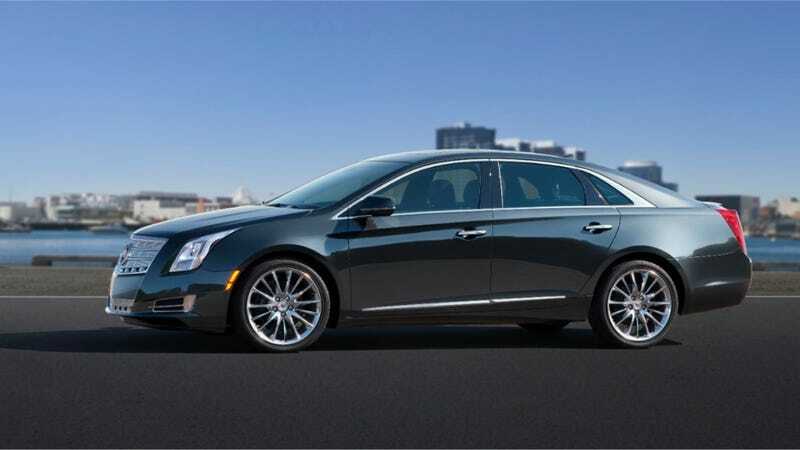 Cadillac confirmed today what we suspected last week about the 2014 XTS VSport: Along with the 2014 CTS, it will in fact get a 3.6-liter twin-turbo V6 engine with a massive amount of horsepower. How massive, exactly? 410 horses and 369 pound-feet of torque. That's more than 100 horsepower over the standard 3.6-liter six, and according to Cadillac, 105 pound-feet more torque more from 1,900 to 5,600 RPM. Whoosh! Cadillac says they didn't just stick two turbos on the 3.6-liter six and call it a day. The new engine has been thoroughly revised with a new cylinder block casting, strengthened connecting rods, domed aluminum pistons and a new direct injection fuel system. No joke, those are impressive numbers from any engine, let alone a V6. It also has more horsepower than the V8 in the original CTS-V.
Best of all, the smaller CTS will get in on this action as well, and it will have 420 horses there. Starting in August, this engine will be an option on the CTS and XTS Vsport models, Cadillac's new line of sub-V performance packages. Sounds great. So where will we see this engine next? A new Camaro? The ATS-V with even more power? Either way, you can sign me up.